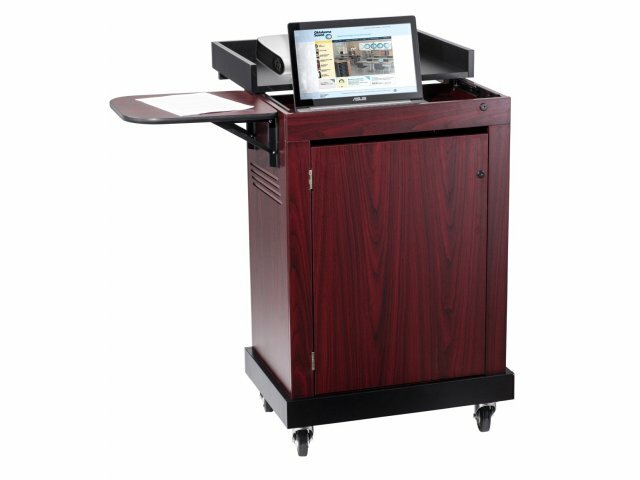 The Smart Laptop Cart Lectern makes multimedia presentations smooth and effortless. It includes everything a professional needs to support all of their equipment. The lockable top secures a laptop, and opens to provide a flip-up shelf, which is perfect for a projector. An additional media shelf on the side is convenient for notes and other accessories. This brilliant piece is way more than a regular multimedia lectern. It includes built-in tablet storage for up to 16 devices. Two locking doors offer secure access, while a built in power strip enables simultaneous charging. Ventilation slots on the sides prevent overheating. Two additional shelves provide ample room to store a projector and other accessories when they are not in use. Smooth Finish: High-pressure thermofused laminate is easy to clean and maintain. Expandable Surface: A convenient media shelf on the side increases surface space and folds up for compact storage. 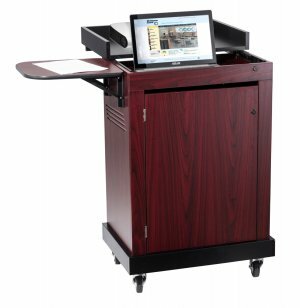 Laptop Friendly: Includes a lockable 2"-deep area for securing laptops. Smart Design: The locking slide-out shelf is perfect for projectors and multimedia equipment. Does not include a built-in amplifier. 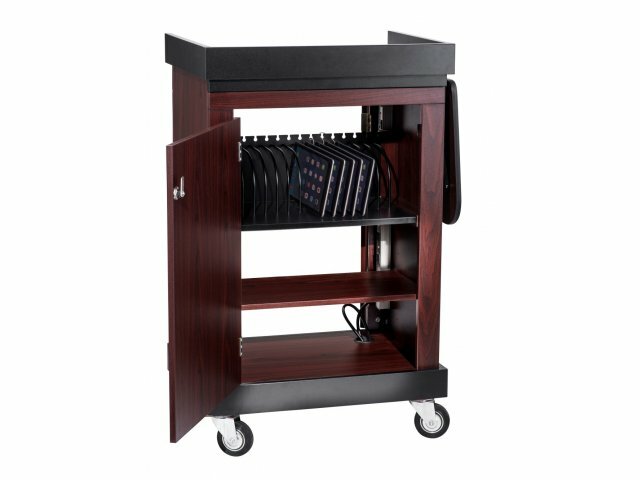 Secure Tablets: A built-in compartment stores up to 16 tablets or chromebooks, with ventilation slots to prevent overheating. Convenient Storage: Two interior shelves offer an excellent place to keep presentation materials. Uncluttered: Wire-management grommets on shelves keep cables organized. Easy Hookup: A built-in power strip makes it easy to plug in electronics. 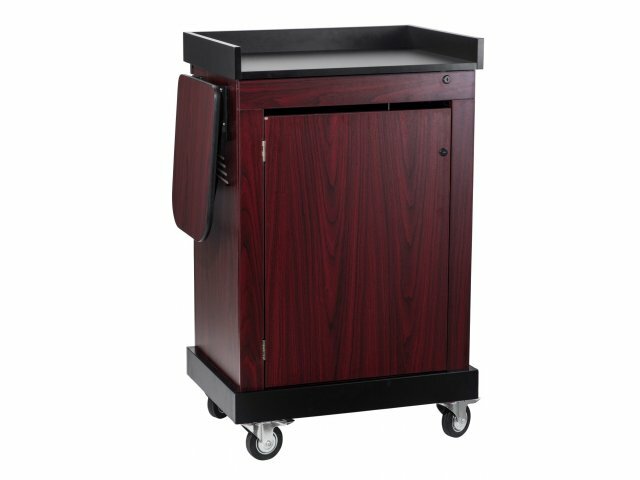 Worry Free: Two locking doors provide secure storage between presentations. Tough Support: Features a solid pinewood base (painted black) for superior support. 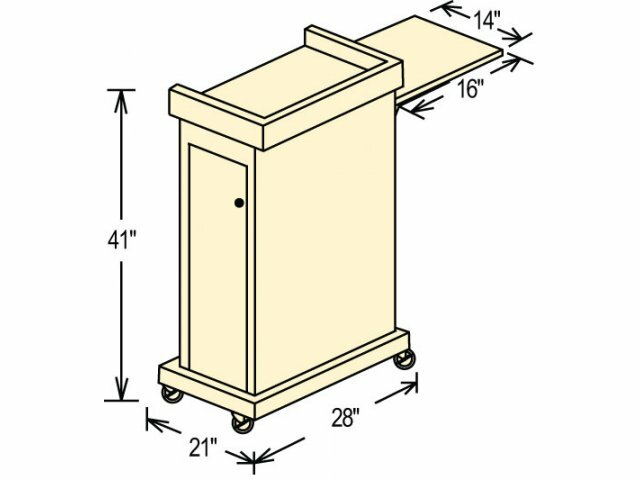 Highly Portable: Rolling casters (2 locking) make transport simple and convenient.